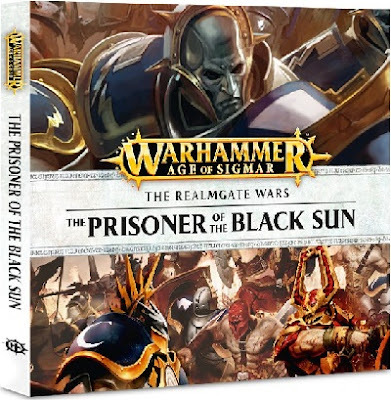 The Prisoner of the Black Sun is the first audio drama to come out from Black Library for Age of Sigmar. When I read that it was the first part of a story to deal with the Realm of Death and that it's written by Josh Reynolds I knew I had to pick it up. The whole story clocks in at a little over an hour and I was able to listen to it during my daily commute in one day. There is a little bit of a prologue before the actual narrative starts where we get to hear Nagash give a small monologue. It's really interesting to listen to, and the way they portrayed his voice as well as the background music came off as suitably eerie. I do kind of wish that they had chosen someone with a middle eastern accent to do his voice since he is a Nehekharen, but it doesn't really detract from the experience. It's interesting finally getting to hear a voice for such an iconic character. If you have read any of Josh Reynolds' previous undead stories then you would know that Nagash's dialogue has always been written in all caps, "LIKE THIS." This was done, I'm assuming, to help convey the power behind him and how powerless anyone is to resist his will. I do wish a bit more of that came across in the reading, but it still felt powerful. After this we move on to the main story of Lord-Celestant Tarsus leading his warrior chamber of the Hallowed Knights into the Realm of Death to seek an audience with Nagash. The only problem is no one knows where the realmgates are that lead to the underworld of Shyish. We open with a battle with a Bloodbound warband, which is exactly what you would expect from such a scene. It was entertaining and well written and kept me enthralled throughout. If you haven't listened to one of Black Library's audio dramas before then you are missing out on all of the added sound effects they use. This isn't just an audio book, it's a full on drama with music and battle sounds. It really brings you into the middle of it. After this it moves onto the meat of the story as the Stormcast Eternals come across a massive ruin that appears to be an old planetarium. We get some interesting flashbacks to Tarsus' life before being reforged as well as becoming more acquainted with their Lord-Relictor, Remus. This is also where they meet the title character, the prisoner held within a massive black iron orrery, or sun. He is a vampire and our first real look at a character from the Realms of Death and he may also be someone that Warhammer fans already know. Without giving the plot and the twist away, the story wraps up with a large battle with a much more massive Bloodbound horde. The most exciting part about this for me is the amount of Khorgoraths used against the Stormcast. It's just an interesting idea that we haven't seen yet. This was definitely one of the most enjoyable battle scenes from AoS so far, and had some awesome stand out moments. It's kind of hard to talk about this story without giving it away since it's only 68 minutes. All I have to say is that I was thoroughly entertained by the story the whole time as well as the acting. The voice cast all did a great job in bringing their respective characters to life and making them unique. I do wish the vampire's voice was a little more different from the Stormcast, specifically Remus' voice, but it wasn't a huge deal. This audio drama is just part one of four and it ends in a way that leaves no doubt about it being the opening chapter. This isn't a huge detriment though when you go into it knowing this, and it has definitely left me excited for the second part and the rest of the series. The Prisoner of the Black Sun does a fantastic job at what it set out to do, being part one of four and setting up a lot of the major players. I'm also partial to the forces of death, so I am excited to see even more of Shyish. I do have to talk briefly about the price though. I bought the physical CD which is priced at $17.99, which I think is a pretty fair price. However, I originally intended to just buy the MP3 since it's a series and not a one off and I needed to think ahead about how much I will be spending on the whole collection. I was disappointed though to find out that the MP3 was only $2 cheaper at $15.99. It wasn't even worthwhile considering the digital version at that price since $2 more gets me something physical to hold in my hand and some pretty swanky packaging. I think the MP3 should have been priced a little closer to $10, even $12.99 would seem more reasonable to me. Despite this I DO highly recommend picking this up if you are an AoS fan. It's a great story that I have already listened to twice (Nagash's monologue three times) and I have no doubt that I will listen to it again. You can buy either version of it, as well as listen to a small preview chunk of it here. You really should at the very least give the free preview a listen.